On Saturday evening, May 14th, members of our community wine club convened their final meeting until September. 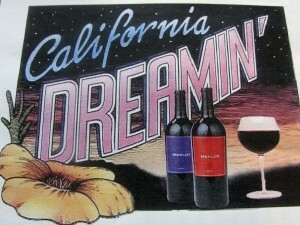 On the libationary agenda were six wines from California… but with a twist. 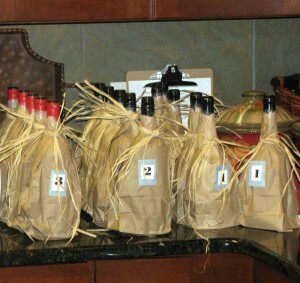 All six wines were tasted blind, the bottles encased in paper sacks to hide their identity. Participants at individual tables were asked to sample these vintages, come to a consensus as to their quality & likeability, and then to rate them from 1 through 5 (1 being the lowest; 5 the highest). 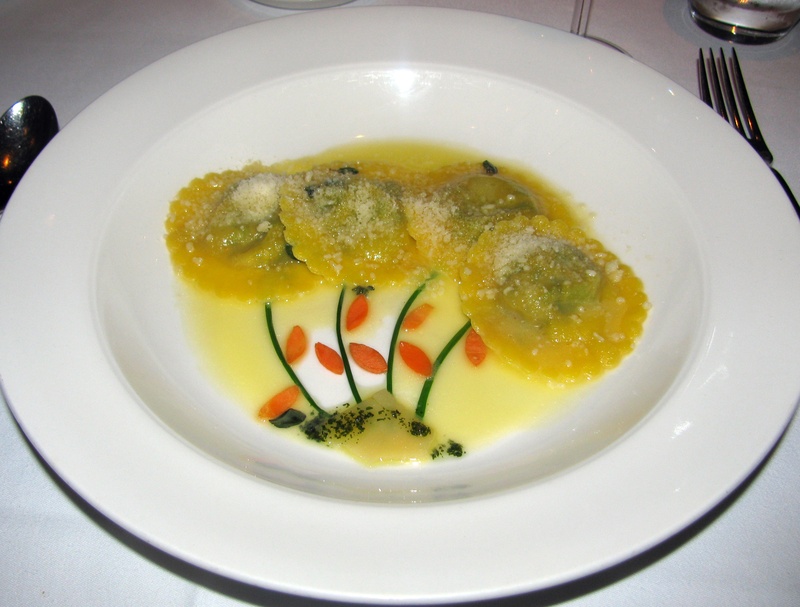 This procedure was followed with three white wines; and then, after a short intermission, with three red wines. I list the wines sampled in the order in which they were presented and rate them, as our hosts of the evening’s tasting requested, from 1 to 5. This vintage is actually a blend: 90% Pinot Grigio; 7% Chenin Blanc; 2% Sauvignon Blanc; and 1% of other mixed white varietals. I freely confess that this wine struck me as incredibly bland on the palate. Unlike Italian Pinot Grigios, which are crisp and refreshing, this wine, in my opinion, suffered from a terminal case of the blahs. The Line Shack is typical of inexpensive New World Chardonnays, bold & buttery on the nose and oaky/smoky on the palate. However, despite the rather high alcoholic content (14.4%), it didn’t seem to have sufficient body. You could do worse… but you could also do better. This wine simply didn’t set off any bells or whistles. The Alma Rosa’s supposed role model is French Chablis, which is known for its crisp, flinty style. As such, this Chardonnay exhibits very little (if any) discernible oak, which, in my view, is certainly not a drawback. Unfortunately, like many other California Chardonnays, it appears to be rather long on alcohol ($14.2%; French Chablis generally falls in the 12.5% – 13% range) and somewhat short on character. If you enjoy big, bold red wines, this Bianchi Syrah is not to be missed. It has incredible body and intensity, “guts,” if you will. But, at the same time, it is decidedly smooth upon the palate; the result of aging 26 months in new French and seasoned American oak barrels. At 14.9%, the alcohol content is nearly off the scale; however, this is perfectly balanced with a bevy of ripe fruit and toasty vanilla. A monster of a wine… but splendidly tamed. The red Zinfandel grape has the reputation of producing intense, lethally alcoholic fruit bombs… but you’d never know it from this incredibly weak & weary Zinfandel blend. The alcoholic content is quite high at 14.5%, but that’s about all this wine has to offer. It is, in my opinion, completely lacking in character, concentration, and structure. Cross this one off your list. This is an extraordinarily elegant & seductive wine. While the above-mentioned Syrah grabs your attention by flexing its significant oenological muscles, the Dominican Oaks Cabernet beguiles your palate with a gentle whisper that is as smooth as silk. There’s a nice hint of oak here, subtle tannins, and a plethoric variety of fruit and spice… but all these elements are beautifully integrated and perfectly balanced. An exceptionally attractive wine at an equally attractive price.